What Does Code P0434 Mean? “Perfect combustion” should result in harmless emissions, only carbon dioxide (CO2) and water vapor (H2O), but “real world” harmful emissions include oxides of nitrogen (NOX), carbon monoxide (CO), and unburned hydrocarbons (HC), consisting of oil and unburned fuel. Proper maintenance and good driving habits help to reduce emissions, but one more piece of onboard equipment seeks to eliminate them entirely. 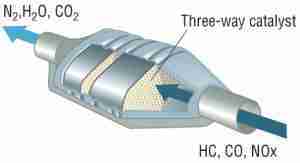 The three-way catalytic converter (TWC), usually just referred to as “the cat,” combines these harmful emissions with leftover oxygen, getting much closer to the “ideal” perfect-combustion emissions model. The TWC is part of the exhaust system, perhaps part of the exhaust manifold or installed in the exhaust pipe, and looks like another muffler or resonator. Inside, however, is a metal or ceramic honeycomb material, doped with a soup of chemicals and precious metals, such as aluminum oxide, titanium dioxide, ceria-zirconia, platinum, palladium, cerium, manganese, and copper. When heated by hot exhaust gases, between 600 °F and 1,600 °F, the TWC reduces NOX to harmless oxygen and nitrogen (O2 and N2) and oxidizes CO and HC to produce harmless CO2 and H2O. The engine control module’s (ECM) primary purpose, aside from running the engine, is to reduce harmful emissions as much as possible, and so it constantly monitors the efficiency of the the TWC. The upstream heated oxygen sensors (HO2S), sometimes referred to as air-fuel ratio (AFR) or lambda sensor, is mainly used to fine-tune air fuel ratio, but the ECM also monitors TWC function by comparing upstream AFR readings to downstream HO2S readings. The AFR sensor is constantly switching from rich to lean and back, reflecting ever-changing oxygen content in the exhaust stream. Once the exhaust passes through the catalytic converter, oxygen content should remain steady, by virtue of the TWC’s reduction and oxidation activities. If the ECM detects that there is too much activity downstream, it determines that the catalytic converter is not heating up enough, sets diagnostic trouble code (DTC) P0434, “Heated Catalyst Temperature Below Threshold (Bank 2),” and illuminates the check engine light (CEL). Depending on the engine, “Bank 2” may refer to the second half of an inline four- or six-cylinder engine, or the cylinder bank of a V6 or V8 engine with cylinder #2. What are the common causes of code P0434 ? DTC P0434 may have number of causes. Here are the most common. 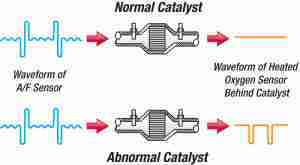 Lack of Maintenance – It does one good to note that the catalytic converter is not a wear item, and should last the life of the vehicle. Unrectified engine problems, such as faulty oxygen sensors or cylinder misfires, for example, can lead to catalyst overheating, over 1,800 °F to 2,500 °F, possible meltdown, and failure. Always maintain your vehicle, use the recommended fluids and parts, and make repairs promptly. 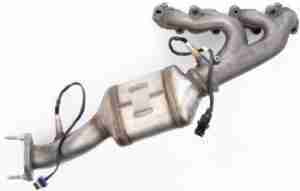 Failure to do so can easily lead to catalytic converter damage. Lazy Oxygen Sensor – It is possible that, even if an AFR sensor passes the ECM monitor, it may be “lazy,” or reacting slowly. The result is a wider swing of rich and lean, constantly overheating and underheating the catalytic converter, eventually leading to damage. The factory repair manual, or equivalent, should give some kind of specification regarding expected switching times. What are the symptoms of code P0434 ? Aside from the CEL, you will most likely not notice any drivability symptoms. Your fuel economy will suffer, however, and your car will be producing higher levels of harmful emissions. How do you troubleshoot code P0434 ? Many people jump to the conclusion that the oxygen sensors must be faulty, reasoning that the expensive catalytic converter, with usually run upwards of $1,000, “can’t be” the fault. Keep in mind, however, that the ECM cannot run the catalytic converter monitor unless the oxygen sensor monitors have run and passed. First, check for leaks in the exhaust system. 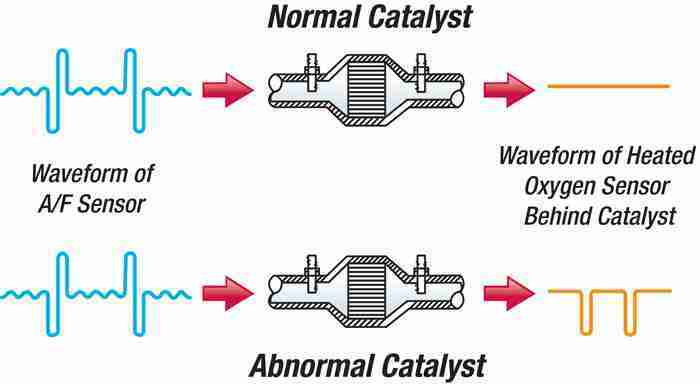 If there are any leaks between the engine and the catalytic converter, this can allow excess oxygen into the exhaust stream, pumping more oxygen into the TWC and skewing AFR and HO2S readings. Make sure you flex the exhaust system, and check around flex joints, gaskets, ball joints, and any rusty spots. Repair as necessary. Again, clear codes and check to see if any codes return. Second, the best way to test catalytic converter operation is with a scan tool, with live data streaming. A digital oscilloscope can be just as effective, as you want to compare voltage readings of the upstream and downstream sensors. With the engine idling, the upstream AFR sensor should be switching between high and low voltage, usually 0.5 V and 3.5 V, (1 V HO2S will switch between 0.2 V and 0.8 V, more or less) depending on manufacturer, and the downstream HO2S should run around 0.5 V. Retry the test at highway cruising speed, which should force the catalytic converter to heat up. Again, look for fast voltage switching on the upstream sensor, slow or no switching on the downstream sensor. In either test, if the downstream sensor mimics the upstream sensor, chances are that the catalytic converter has been compromised. None found. Ask a question about P0434.